Very specific pictures of the upper cervical spine are taken to give the doctor the exact location of your subluxation. There are potentially hundreds of different combinations of upper cervical subluxations and these specific pictures show the doctors exactly how they need to correct the nerve interference. 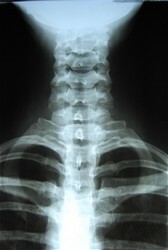 Specific cervical x-rays takes any "guesswork" out of our analysis. Our doctors never want to guess with anything having to do with your nervous system. Depending on the findings, the chiropractors may call for an MRI or other imaging studies, if necessary.